In the floor version, Berenice is the ideal and discreet companion to people wanting to rest. 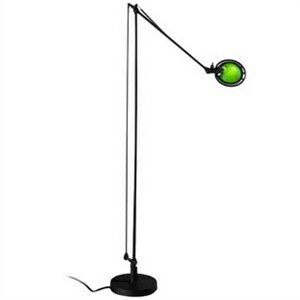 It is the inimitable founding product of a new type range of reasonably small sprung-jointed lamps. The fluid articulation of its movements and its perfect stability make Berenice the light that can be moved around without occupying valuable space and with the least trouble. Berenice operates with a transformer that allows low voltage power to reach the bulb through the rods without electrical cable, thus leaving its figure slender and elegant. Thanks to a special spacer fitted into the lower part of the head, the light can be brought very close to whatever needs to be illuminated, while maintaining the proper distance from objects. A simple touch of the head ring, which is well insulated and independent from the bulb housing, will also orient the light in any direction. Metal parts in diecast aluminum, reinforced nylon frictional joints, rynite head. Parabolic reflector in pressed glass or metal.